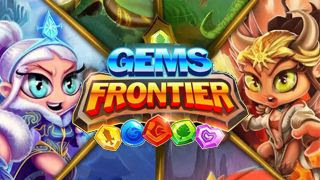 Gems Frontier is a fast paced Match-3 strategy puzzle mobile game presented by Cloudcade, Inc. Available from the App Store and Google Play. Collect and upgrade legendary heroes, plan and compose your ultimate battle squad and trigger deadly leader and minion skills to climb the rankings through thrilling, addictive and fast-paced matches. - Each team is composed of 1 Leader and 3 Minions of each faction (Fire, Earth and Water Elements). - The objective of the game is to defeat the opponent's Leader by diminishing it's Health (HP). - Any of the three starter Leaders, but would recommend Blizzard, mainly because his freeze skill will let you chain combos while the enemy is frozen for 5 seconds! Plus, most of the time you'll be up against AI enemies anyway so the other 2 won't really help much unless they get upgrades. - Fallen Angel: Damage vs all minions, useful for clearing them out early on to open up chances for direct damages vs the enemy Leader. Works well with Vanquisher. - Wood Golem or Lich: Wood Golem for defensive type, Lich for offensive type. Works well with Serenity. - Mist: Mainly for direct damage, useful during the latter part of battle when all enemy minions are dead. Works well with Blizzard. - The Baron: Creates a random combo jewel on the board which is really cool, but his casting time is just too long! - Ranger: Decent green minion that can nuke Earth, use if you don't have any of the two above. - Depth Knight: Nice alternative minion nuker, especially with upgrades. - Ice Queen: She is quite good but kinda situational, and needs timing. *These teams should be able to help you reach at least 1800 Trophies, more once your Leader gets some upgrades. Also note that player skill is also very important, refer below for more info. - Your Leader will be given a chance to attack and decrease the opponent's Leader HP. - Heals the user's Leader HP (effect increases as you Lvl Up). - Fire Minion attacks the opponent's Earth Minion. - Earth Minion attacks the opponent's Water Minion. - Water Minion attacks the opponent's Fire Minion. - The Leader always attacks opponent's Leader. - Each minion attacks their respective counter elements, but if the target minion is dead, the attack is delivered to the opponent's leader. - The dead minion (becomes a ghost) does not proc the special skill, but the ghost can still attack at 50% of normal attack. 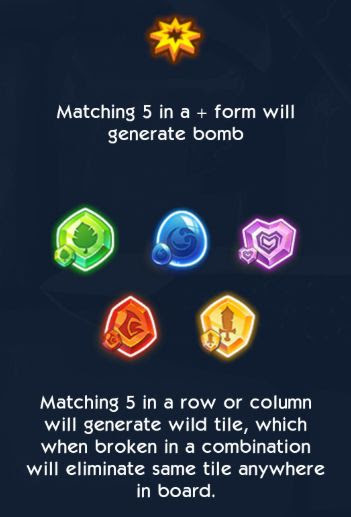 - Match more than 3 jewels to create combos. - To make the following combos effective, these need to be matched with the respective tiles. - Matching Fire, Earth, and Water jewels also increases the Mana of respective heroes. - Once Mana is full, it procs the special skill of that Hero. - Each Hero has different Mana agility: 1 Mana = 5 Jewels Match. - Winning battles depends on your team composition, upgrades, and player skill which is very important. - Break Gems As Much As You Can! - The fastest way to break gems is to create combos, so aim for at least 4 gems if you get the chance. This is where Player Skill comes into play. - This is what you should be scouting on too during the countdown timer from the start. - Prioritize Your Leader's Gems! 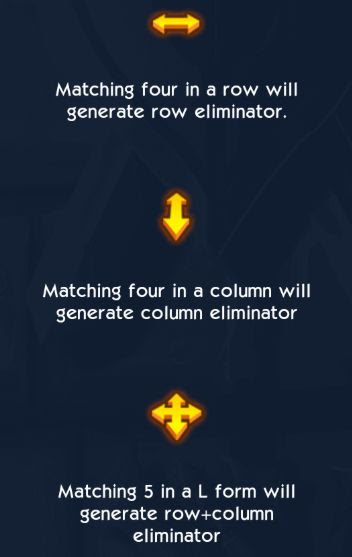 - This is also important as it can give you a huge advantage if you can fire their skill asap. Plus, it would also trigger your minion's skill that has similar gem color. Yep, it's like shooting 2 birds with one stone. - At higher difficulty, you might need to fire 2 of your Leader's skill to defeat AI enemies. - Yes, you need to act and move any gem every time you have the chance, any lags in-between will cost you a lot, especially when battling against AI at higher difficulty. - Tip: To avoid this, you can trigger a break from the left side of the board, then quickly focus your attention on the right side of the board and look for another combo or break. - A hero can be upgraded for superior powers. In order to upgrade a hero you must unlock multiple cards of the same hero. - Heroes can be earned from chests (recommended for F2Ps) or can be purchased from shop on availability (optional). - Upgrade all of your Heroes to gain EXP points and Lvl up your own Lvl. - Leveling Up will unlock certain features or increase some Jewels effect (ex: Health Jewel's healing amount). - You can also gather EXP points from after battle rewards, but only limited to a number of wins. I believe this resets at server time (exact time is uncertain). - Use your Gold to upgrade them all, but you need to choose which heroes to upgrade beyond 1000 Gold. - Only use your Gold for upgrading your Leader and Heroes. - Your main Leader will require far greater Gold to upgrade so, save up at least 5,000 Gold for their first upgrade. - Gold can also be obtained from free chests, battle reward chests and guild chests. - Earn and exchange them for Gold, you need lots of this for upgrading! - You can also gather some Gold from after battle rewards, but only limited to a number of wins. I believe this resets at server time (exact time is uncertain). - Gems can be obtained from free chests, battle reward chests and guild chests. 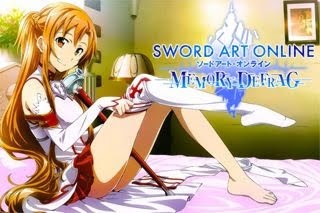 - You may also login using your Facebook account to receive 50 Gems from the start of the game. - Chests are great way to earn heroes and Gold. You can earn chests by winning the combats. - Free Chests are also available at regular intervals. - For exclusive rewards you can also buy chests from the store (optional). - Star chest is available after 12 hours. Once available you have to win 10 combats to earn the chest. *Note that the number of Gold, Gems, and Reward Cards that you can get from the above chests depends on what Arena Lvl you got them. The higher, the better the rewards. - You earn or lose trophies based on the battle result. The trophy count is based on the opponent's strength e.g. if the opponent is strong you will collect more trophies than defeating a weak opponent and vise versa. - Leaderboards are based on trophies. Leaderboards are reset after a specific time.